Its not dead. But Gratzer is definitely a long-buried style from Poland. 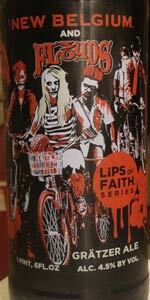 Together with 3 Floyds we unearthed its robust smokiness with oak smoked wheat and midnight wheat. Polish Lublin hops for a bitter bite and lacto for a slightly sour finish, this pours out a billowing, foamy mouth worth indulging. Pours pitch black with a pretty solid one finger light tan head. The wheat in this beer is really showing through with the impressive head and head retention. Aroma is chock-full of smoke. A cross between bacon and a campfire. I'm trying to pick up anything under the smoke and there isn't a whole lot; maybe just a hint of cherries or other dark fruits. The flavor is really nice. Just loaded with smoke in that it almost overwhelms the taste buds on the first sip. Once you get further into the beer, however, some deeper flavors begin to emerge. The oak comes through nicely along with dark bread and roasted grain husk. Dark fruit begins to permeate through along with a quick shot of moderately intense bitterness. All is finished off with a mild sourness helping to cleanse the palate. Overall, as a huge fan of smoked beers this one is wonderfully unique. I love the intense smokiness but there really is a good going on underneath and I feel the characteristics change as the beer warms and my palate adjusts to the smoke. I very good beer that is worth seeking out if you're a fan smoke. Pours a very dark and rich black color that is 99% impenetrable to light. The head is a nice light tan that is thick, long lived and leaves a very nice lacing down the glass. The nose is strong with definite notes of coffee, caramel, alcohol, biscuits, wet earth, vanilla & caramel. The taste is a nice and complex experience of varied bitters from dark chocolate, coffee and hops to coriander, nutmeg and camphor. The mouthfeel is rich and allows the flavor to coat the palate perfectly. Overall this is an exceptional beer and a fantastic taste experience. I highly recommend it as it is one of the all time best Lips of Faith versions to date. A-4.5 This beer pours a jet black opaque body with a cocoa colored head that breaks into thick lumps after a bit but continues to give good lacing with each sip. Too dense to see any bubbles. S- 4 The rich mellow midnight wheat aroma has some more dark roasted malt notes that linger in the finish. T- 4 smooth mellow midnight wheat flavor has a slight smoke hint to it with a gentle black roasted note in the finish with no bitterness. There is a hint of dark cola and smoke in the finish with a gentle green tartness. M- 4 this beer has a medium mouthfeel with a slight slippery texture and no alcohol heat. O- 4.5 This beer has a nice mellow dark roast character but more mellow and lighter than a typical stout and some nice tartness and smoke note that offer nice support from the background. Good depth but light and sessionable. Forward thinking brewers clang heads for the challenged, distinctive and polarizing taste that is of old-world gratzer. Its the sour, smoky and wheaten influences the converge for complex taste... or is it complicated taste? Dark and toasty upon the pour, the senses pick up on notes of vinegar-based barbecue almost immediately. With the aroma and early taste of smoldering embers and the tangy vinous character of sour grapes and dry chardonnay align on the early palate with a Dr. Jekyll and Mr. Hyde type of schizophrenia. The middle opens up to the savoriness of burnt toast, roasted pecan, light coffee and dry cocoa powder. Much like biting on apple skin and grape seed, an acute astringency links up to the tangy tartness found in drier white wine for a collection of palate sensations and flavors to battle for prominence over the tongue. Its bulk of wheat bread and associated doughy sweetness retreats quickly in finish and leaves the taste of toasted grain and sourness to continue duel it out even late on the palate. Growing spiciness of peppercorn elevates the toast and smoke and eventually outlasts the sourness in a dry and oaky aftertaste. Love New Belgium, though this isn't a grand slam winner for me like Portage and Rampant. Not a full technical review, just a few notes. -couldn't taste or smell smokey like everyone says. Not sure when it was born though, might be an older bottle (though it says its good until may 2015, and its the end of march). -by how dark and rich the taste is of chocolate and oak, I was highly suprised how watery the mouth felt. Something this dark and "stouty", I figured I would be having a glaze of coffee across my tongue. Sadly, it was like water. Though this is the first time I've and a wheat beer this dark so I'm not sure if its normal. The sour tang they say that the lacto adds is a total plus in my book, as it says its suppose to. I recently had a skunked beet that wasn't suppose to be sour but didn't know until I called the brewery. This tasts more deliberate though, and is a nice mix to the usual for me. -the color was pronominal! Looks clean, but I can't see the light on the other side. The head was nice and mocha colored. killer! Draft at PreFunk - Boise. Dark and woody, smokiness doesn't kick in until the taste. Light beige head and some slick lacing. Bitter and dry finish. Nice rauch accents on this.